I have been having some wonderful feedback from the experiences I have been sharing with you these past few months. Please keep them coming! A lot of people have asked for more accounts of when I have had communion with hosts from the spirit world. The spiritual unions I experience are often difficult to explain. It comes from a symbiosis between our world and the next and though they can be either positively or negatively charged, they are nonetheless powerful and long lasting. Not just that, I also know that whatever message or lesson I have taken away with me after such an episode, has not only been relevant to my life at the time, but has also stayed with me ever since. If I look back over my life I can think of numerous times when I have benefited from the force of the spirit world and so have long since come to the conclusion that what we are actually experiencing is a series of signposts set out in front of us by the hereafter. I believe that it was this force that led me to a most wonderful and fulfilling experience shortly after a recent return from America. Through my connections in the States, I had the good fortune to be asked to do a sitting with a woman called Ellie, who had spent a while in her youth as an actress and model. I met her in her apartment, which although small, was tastefully decorated. There were a couple of professional photos of herself in various cities and as I admired them politely, she smiled shyly. I got the feeling immediately that this hadn’t exactly been her idea but that she was willing to chat with me and see what came out of it. It doesn’t often make a difference if the person I am sitting with is open to the spirit world or not – spirits don’t care whether you’re listening! But it does make the hour easier to bear if a person is at least unopposed. I think she wanted to be hospitable so she made us both a pot of tea and we sat in her sitting room, with the sunlight bathing us in its warmth and chatted. She had been in a TV ad for Camay soap and was quite self-deprecating as she told me how embarrassed she had felt when the producer of the commercial had said her hands weren’t suitable to be filmed. He’d then added insult to injury by insisting that a pair of stunt hands were used instead of hers. This may have sounded easy but it made me laugh as Ellie described the scene that followed; her face in the camera shot while a second woman – whose hands had passed the producer’s suitability test – stood beneath her, out of shot, and rubbing the soap onto her cheek. Her account of how awkward that was and how funny it now seemed to her made her very easy to talk to and I was able to communicate many important messages to her. As I say, during the sitting, several contacts were achieved and she was pleased with what she heard. However, by far the most intriguing communications related to information about her boyfriend at the time who was called Tim. Through the connections, I was able to pick up that Tim had recently purchased a property in France. She raised her eyebrows and evidently this was very recent news which I got the impression hardly anyone else knew about. I added that I was getting the notion that they intended not only to use the property for their own enjoyment but it was also to be a business venture. Ellie simply nodded her head. But the really fascinating information was yet to come. I started to pick up an underlying Spiritual force that lay in and around the grounds of that property and as I told her, she went quite still. She took a drink from her tea and cleared her throat. She asked me if I could be sure and I replied that it was undeniably there. However, and I added this with reserved caution, I was unable at that point to be sure if the force which I felt connected to the French location was a positive or indeed negative energy. Try as I might, I was unsuccessful in ascertaining any further sentiments about the affair and we continued for a few more minutes with messages more personal to her. As I was leaving, I let her know that I would be available should she need me further and she promised to be in touch. Several days after the sitting I received a telephone call from Ellie who said her partner Tim was more than curious to know more about the nature of the energy I had experienced attached to the land they’d bought in France. When she put him on, he laughed when I explained that though my talents were strong, I’d never really had much luck communing with the spirit world over the phone. Perhaps they don’t have great coverage out there, I joked. This was how it transpired over our phone call that he was really keen for me to come over and visit the place for myself. Barely pausing for breath, he invited me to come over to stay with them in France: he was desperate that I should have another attempt at sensing the spiritual energies I had felt during Ellie’s sitting in order to discover what purpose they had. At the very least, he reasoned, we should meet up in person while I was still in the States. Naturally I agreed and the following day I was back at Ellie’s apartment, having more tea. He was an outdoors kind of man, probably in his late fifties although he looked younger and very warm as he shook me by the hand with a large friendly smile. He told me more about the property and as he did, it all began to feel very familiar. 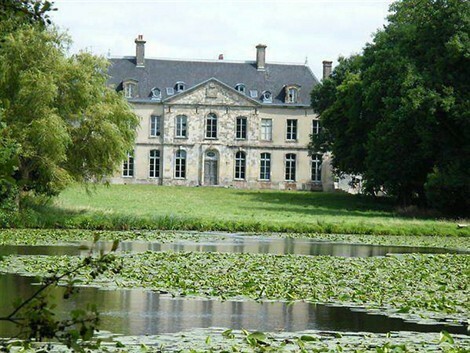 About a thirty minute drive from Cherbourg, and very close to the Normandy beaches, the Chateau was, as he put it, a decent size with over a hundred and forty rooms. I agreed: that did sound decent. It had been built in the Twelfth century in a place called Neufmesnil and had been used initially as a Catholic monastery and stopping off place where pilgrims rested on their onward voyages to sacred and holy spots within Europe. According to Tim, the abbey also had its own springs which were considered to have healing properties and that local folklore claimed that the original monks themselves used to make potions and herbal remedies for the local inhabitants and the visiting pilgrims. It seemed so incongruent to be sitting in a modern high rise in and yet talking about a Twelfth century chateau but I was immediately transported, not just across the ocean but back in time. He went on to tell me that around the time of the French revolution, the abbey had been owned by a French aristocratic family who sympathised with the revolution and sold it for the good of the cause but by 1845 its adjoining church and part of its battlements had been destroyed. Passing through many hands in the following years, the chateau was used as a private home until eventually it was bequeathed in the 1880s to an order of nuns, who returned the building to its original raison d’etre and occupied the abbey until 1982 when they were no longer able to maintain such vast grounds. I felt my head swimming with such a continuous stream of information and there was more to come! It was all so absorbing that I felt myself falling into a mesmeric trance where I could hear Tim’s voice but see the Chateau in my mind. He continued his mysterious lecture. During the War years, in particular those that witnessed the German occupation of France, the Nuns transformed part of the Abbey into a hospital, in the sheer hope that this might deter the Germans from occupying the place. This was not to be as a small section did move in and still today there is graffiti in German on some of the interior walls and bullet holes can be found in some of the sacred statues, where they were used as target practice. Fast forward to 1990 when the Abbey finally fell back into private ownership – by another Brit – who turned it, to the dismay of local historians and neighbours, into (of all things) a night club. Fortunately, this had gone down like a lead balloon with the local inhabitants and, as it had failed to get off the ground, was put up for sale again. Enter Tim. When he discovered the place – what with its beauty and history – he immediately fell head over heels in love with it and all its surroundings and felt that he would be the person to restore it to its former glory and bring it back into the limelight of the local area where it belonged. I sat in silence for a few minutes after Tim had finished talking and sipped thoughtfully from my cup of tea. It was a lot of information to soak up and I felt certain that if I were to go there, I would again feel that presence from the spirit world which had contacted me when I had had my sitting with Ellie. It was an absolute faith I had in my heart. Tim was eager to know if I would come to see the place for myself. As a sweetener he tried to convince me that local gossip claimed there was a malevolent spirit attached to the memory of an Abbot who had been killed by single pistol shot to the neck. It wasn’t simply for this that I agreed to come but I looked up and smiled. Who wouldn’t want to jet over to France? I left them both and started to make all the necessary arrangements; my business partners at the time had also been invited and I got on the phone to tell them all about it. It was a mere month later when the trip was upon us. Arriving at Cherbourg ferry terminus on the overnight channel crossing from Portsmouth, my two partners and I were tired and still hadn’t found our land legs as we headed towards the quiet town of La Haye du Puits. The scenery was lush and overgrown and the air was damp but we held our breaths in mild trepidation of our end point. We turned off the road just before the town when we reached a sign indicating the direction to the Abbey de Blanchelande. After a long and winding drive under a canopy of trees, the aspect suddenly opened out and we caught our first sight of the abbey. Across from us was a huge expanse of water swamped with lily pads so thick it looked like we could have left the car behind and walked across the lake to the impressive house. From afar, the building looked as if it would be 18th century but I knew from what Tim had told me that it was medieval and as we neared the oversized gate house we could see examples of gothic arches which gave away its age: there had obviously been a lot of add-ons in its history. We continued our approach to the main building. Large and imposing though it was, what really struck me was the peace and tranquillity surrounding the abbey. It was as clear as day to me that the air itself was pregnant with healing energy emanating from the trees and the verdant vegetation which encircled the place. It looked and felt as if the masonry and the undergrowth had long ago put aside their differences and begun to co-habit the same space and heart. The same could be said about this world and the next; I felt sure that the two were very close here. Even before we entered the abbey, I knew that we were in a magical place. Tim and Ellie had told us to drive round to the back of the abbey where we would find the kitchen, a more modern part of the structure. The sun shone through a gap in the cloud overhead and suddenly this side was much cosier than the austere frontage; you’d be forgiven for thinking you were at a small gite in the countryside. As we got out of the car, Tim and Ellie came out of a small door with broad cheerful smiles. They greeted us warmly – a la European – and offered us hot coffee and local cheese (amazing cheese) to help revitalise us after our long journey. I had to stop myself from wolfing it all down, not realising how hungry I had become (did I mention how good the cheese was?). Once we were refreshed, we were given a proper tour of the abbey. They began to explain the re-modelling they had already started and every now and again you could see a ladder propped up against a doorway, or varying shades of paint patched onto a wall. From the kitchen we were lead into the main entrance hall, where a large, sweeping, stone staircase formed the centre piece. An echoing lounge led away from the entrance with tall ornate mirrors and cherubs guarding each side of the cavernous fireplace. It was still painted in a drab grey which was apparently chosen by the nuns in an attempt to eradicate any appearance of luxury. Ellie sighed loudly as she walked past, obviously not keen on the colour. The dining room was again a large room with a high ceiling but much warmer than the Salon, probably because of its stunning surrounding panelled walls. I stood for a second absorbing the ambience. The atmosphere was such that it was easy to imagine the scraping of spoons on plates, as the original monks made all that they could of their meagre rations, and the sound of their subdued voices as they made their way to evening mass. We went through to the library, an austere room that had been turned into a hospital during World War Two and was a stark comparison to the cheerier rooms we had just passed. The atmosphere was quite chilling in here as if the rows of shelves had absorbed the terror the nuns must have felt while trying to prevent the abbey from being occupied by the German soldiers. I could definitely sense pain and suffering and shuddered to think at what atrocities the books had witnessed over the years. We moved on. Yards and yards of corridors stretched out from the front of the building with room upon room beside each other and the more I walked down the stronger I could feel the power of the monks’ prayers still alive in them. It was no surprise to me that after centuries of devotion, the strong atmosphere of earnest prayer and good intentions permeated the whole of the abbey but the real surprise was around the corner. Literally. Along the winding corridors, we approached the west wing. Immediately, I felt the mood within the walls change dramatically. As I walked half way down, I came across a narrow opening in the large stone bricks and I stopped dead in my tracks. Everyone had continued walking ahead but when they realised I had halted behind, they all came back to where I was standing. Within the opening I could just about see a slim set of stairs hidden discretely beyond the wall which curved smoothly away from the direction of the corridor we were in. From just a step in either direction in the hallway, it could easily have been missed and would have been completely secret behind a tapestry. Straight away I could sense Spirit as clearly as I could see everyone else. Tim was excited by my reaction. It was rumoured that that stairway had a very dark past. According to folklore, it had been used as a secret conduit for prostitutes who would have been taken up the staircase to rendezvous with those monks who were perhaps a little less committed to the holy order than they might have been. Without further ado, I started to climb. When I got to the top of the steps I found myself in the actual eves of the rafters of the abbey. The wooden beams were dusty and full of cobwebs and had been re-supported many times over and looked like a fretwork of centuries’ worth of reconstruction. Within what should have been the open space of the lofts, was a room rudely constructed from makeshift walls and a space where a door might have been. My business partners called up to me but I asked them to give me a minute. A cold chill went through me, stabbing me like a knife and stifling the air from my throat, as I knew beyond the shadow of a doubt that murder had been committed there. In the shadowy recesses of the room, a very strong terror came over me and I could sense that the horror came from a woman. As I looked to each corner of the room, I experienced the sensations as experienced by someone I felt to be a prostitute who had been treated beyond badly in that very room. Sadly, I picked up that she had been viciously strangled by her own bodice lace despite her attempts to fight back or run away. The menacing emotions which still lingered mingled with the perpetual fear that the girl would undergo. Feeling a chill down my spine I beat a hasty retreat back down the stairway, knowing that I was definitely unwelcome in this place and was being watched all the way back. Downstairs, I must have looked visibly shaken as Tim and Ellie wondered if we should go on but I felt that it was something I had to do. We continued to the original 12th century chapel which adjoins the abbey. Here the Spirit I could sense was wonderful and simply divine: a dramatic contrast to the Spirit in the room in the rafters. You can virtually slide yourself in and out of the vibration here as the curtain that divides this world and the next is extremely thin. This was quite obviously a deeply spiritual place as I could sense monks at prayer and could hear the mysterious chants still sounding out across the vibrations of time. This was certainly a place of immense potential. The visit was deemed a great success by all and as I said at the beginning, its memory has stayed with me ever since. Synchronicity, to me, is not just a word that expresses a meaningful coincidence but is also the manifestation of an energy that can enter a person’s life, bringing about stark change within a really short time. I would also describe it as being a catalyst that causes a chain of events which can lead towards a greater good. Tim and Ellie said that they now looked at their venture with renewed reverence and vowed to restore it to the benevolent site it had always intended to be. I do believe that Tim sold the property and has moved on to what he believes to be better things in life.